The Vancouver Olympics was great. I guess I’ve watch a bit too much on television, but it was a great watch. The Norwegian broadcaste NRK (Norwegian Broadcasting Corporation) went HD on February the 12th, the same day as the Olympics startet. So it’s have been great to watch everyting in HD. The Olympics started tragically with the death of Nodar Kumaritashvili in luge training. In the eyes of us Norwegians, it was a great Olympics. It started a bit slow, but in the end we got 9 gold medals, 8 silver and 6 bronze medals. 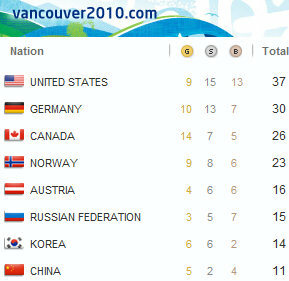 That’s a total of 23 medals, only surpassed USA, Germany and Canada. For everything Olympics, go to Vancouver2010.com.